1. Use intelligent temperature controlling machine to have accurate temperature control, ensure the artistic and neat seat. 2. Use PLC control servo double-pull and single pull membrane, structure, super touch screen structure drives the control center, maximize the whole machine’s control precision, reliability and intelligentized level. 3. This machine completes the whole packing procedure of measuring, loading materials, bagging, date printing, charging and products transporting automatically as well as counting. 4. Have error indicating system, helping handle the trouble immediately. 5. Make block bags and hanging bags according to customer’s different requires. 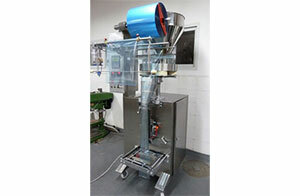 Usage: Suitable for automatic packing of popped food , fruit, candy, biscuit, deep frozen food, melon seeds, roasted nut, pips and other granule materials.